Although women's advocacy has been present in Japan since the 19th century, women's suffrage in Japan blossomed during the turbulent, 1920s, inter-war period. Whilst experiencing marked cultural upheaval, women's suffrage became a feature of the changing society of Japan. After the Meiji Restoration in 1868, the concept of human rights and universal suffrage began to take hold in Japan. During the late 19th century, the first proponents for women's rights advocated, not for political inclusion or voting rights, but for reforms in the patriarchal society oppressing women. Of prime importance to the early feminist movement was the call for women's education. Policymakers believed that this was imperative to the preservation of the state, as it would prepare girls to become effective wives and mothers capable of producing diligent, patriotic sons. Although policymakers did not necessarily have the same motives as women's rights advocates in their call for women's education, the availability of education opened the door for further advancements for women in Japanese society. The end of the 19th century also saw the fight for protection of women from patriarchal cultural practices. Practices such as prostitution and polygamy had long subjected them to abuse, in particular sexually transmitted diseases. Feminists began to oppose both the exclusive provision of civil rights for men and the exclusion of women from politics. Women in Japan were prohibited, by law, from joining political parties, expressing political views, and attending political meetings. By 1920, the fight for women's political inclusion was at the forefront of the suffrage movement and, in 1921, the Diet of Japan (parliament) overruled Article 5 of the Police Security Act by granting women the right to attend political meetings. However, the ban on women's involvement in political parties was not altered, as many members of the Diet felt that it was selfish for women to forsake their families for government. Feminists were still determined to fight for political equality. The Women's Suffrage League was founded in 1924, the same year that the Japanese government enacted the Men's Suffrage Law, without extending the vote to women. 6) It is both necessary and possible to bring together women of different religions and occupations in a movement for women's suffrage. The League, as well as numerous other groups, continued to fight for social and political inclusion, as well as legal protection from the patriarchal traditions that continued in Japan. Women were finally granted the right to vote in 1946, in part due to pressure from the occupying forces of the United States. Shidzue Katō: (1897–2001) As a member of the Japanese Socialist Party, Shidzue Kato was the first woman elected to the Imperial Diet. She spent the majority of her life fighting for women’s reproductive and political rights. She is noted for annulling her marriage and remarrying, an act that was extremely rare for women at the time. Fusae Ichikawa: (1893–1981) Advocate for women’s political rights. Ichikawa concentrated most of her efforts towards gaining women the right to participate in the voting process and in political parties. With Hiratsuka Raicho, she helped establish the New Woman Association. Her involvement extended to the Patriotic Press Association and the League for Women’s Suffrage (Fusen Kakutoku Domei). Ichikawa traveled to the United States shortly after World War I and observed the advancements American women such as Alice Paul had made in the fight for equality and political rights. She returned to Japan, remained an outspoken voice for women’s rights, and was elected to the Japan’s House of Councillors in the 1950s. Shigeri Yamataka: (1899-1977) Worked closely with Ichikawa in the Women's Suffrage League. After World War II, she was twice elected to the House of Councillors, the upper house of the Diet of Japan, and was a president of the National Federation of Regional Women's Organizations, Chifuren, until her death in 1977. Hiratsuka Raichō: (1886–1971 ) Women’s rights advocate who was key in the founding of the Shin Fujin Kyokai, or New Woman Association, in 1919. Hiratsuka was noted for her belief that achieving the rights of inclusion in all aspects of Japanese society would have to be secondary to unifying women as a class. First women in Japanese Diet. 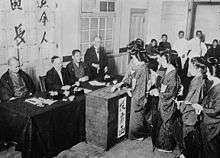 In 1890, the first session of the Imperial Diet issues the Law on Assembly and Political Association (shukai oyobi seishaho), which is the first government issued decree banning women from joining political parties. However, in 1921, the Diet voted to overrule this decree allowing women to attend political meetings. With constraints prohibiting women from actively participating in politics, women's interest groups and other advocates continued to persevere for voting and inclusion rights, which did not arrive until 1945 when the election law was revised under the U.S. occupation of Japan, allowing women over the age of twenty to vote in elections. One of the most effective ways in which women were active in the suffrage movement was through literary outlets. During the interwar period, the number of educated women in Japan was at its highest. These women, many of whom were graduates of Japan's finest institutions of higher learning, began using their education as a weapon in the fight against oppression. Literary serials such as Seito, Fujin Koron, and Shufu No Tomo were the most popular feminist magazines of the time. They often tackled issues such as abortion, sexuality, politics, and independence. Such magazines sometimes included Western literary works that were often deemed controversial to the largely conservative Japanese population. Tradition calls for Japanese women to serve as willing subordinates to men. One of the most popular sayings of the time was ryosai kenbo, which means "good wife, wise mother". This subservient role can be traced to the widely accepted and revered teachings of Hayashi Razan, who developed a Confucian school of thought that emphasized superiority and inferiority in certain relationships. According to this school of thought, the relationship between husband and wife relied upon a woman fully devoting herself to the needs and success of her husband. Hayashi Razan's teachings, although developed during the seventeenth century, were the basis of the Japanese social and cultural structure for centuries. Women traditionally were to focus all of their efforts to the maintenance and development of their households, and their work was limited to domestic and agricultural tasks. With the evolution of Japan as a growing industrialized nation and with the reformation of Japanese society, women became the majority in newly built factories that became necessary to support Japan's booming textile industry. Although these women were allowed to leave their homes and earn wages, they were still held captive by patriarchal constraints. Many women in the workforce had been sent by their families to work in factories that would send their earnings back to their homes. They were provided room and board for the duration of their employment, but the conditions where they lived and worked were deplorable and resulted in widespread illness and disease. The conditions, their mediocre salaries, and their risk of developing life-threatening medical conditions were the driving force behind the suffrage movement's desire to improve the state of the workplace for women. ↑ Molony, Barbara. "Women’s Rights, Feminism, and Suffrage in Japan, 1870-1925". The Pacific Historical Review, Vol. 69, No. 4, Woman Suffrage: The View from the Pacific. (Nov. 2000), p. 657. Mary R. Beard (May 1947). "Woman's Role in Society (in Women in Present-Day Society)". Annals of the American Academy of Political and Social Science. 251: 1–9. doi:10.1177/000271624725100102. Barbara Molony (November 2000). "Women's Rights, Feminism, and Suffragism in Japan, 1870-1925". The Pacific Historical Review. 69: 639–661. doi:10.2307/3641228. Yoko Nuita; Nuita, Yoko (Autumn 1978). "Fusae Ichikawa: Japanese Women Suffragist". Frontiers: A Journal of Women's Studies. 3 (3): 58–62. doi:10.2307/3346332. JSTOR 3346332. Pauline Reich; Fukuda, Atsuko (Autumn 1976). "Japan's Literary Feminists: The "Seito" Group". Signs. 2: 280–291. doi:10.1086/493355. Taki Fujita (January 1968). "Women and Politics in Japan in Evaluations of the Political Responsibilities That Women Are Exercising, by Regions or Countries". Annals of the American Academy of Political and Social Science. 375: 91–95. Wikimedia Commons has media related to Women's suffrage in Japan.